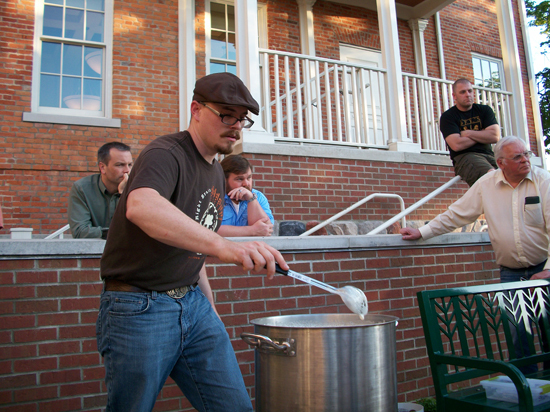 Posted on Thu, Mar 22, 2012 : 2:02 p.m.
Chris Martinson, who plans to open the Chelsea Alehouse Brewery by September 1, at a homebrewing demonstration at the Chelsea District Library in 2010. Months after announcing his plans to launch a new brewery in downtown Chelsea, Chris Martinson has finalized a location for the Chelsea Alehouse: the Chelsea Clocktower development. 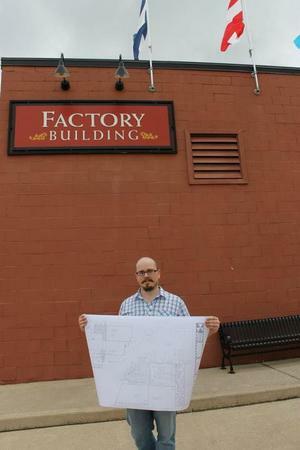 Martinson signed a lease last week for a 4,200-square-foot space in the factory building, located next to the Chelsea Teddy Bear Company just off Main Street. The goal, he said, is to begin renovations soon and open by September 1. The plan for the space is to use roughly 1,000 square feet for the brewery and transform the rest into a pub with sandwiches, salads and appetizers made from locally sourced food whenever possible. There will be a variety of ales that will include seasonal selections, a stage for live music and an outdoor seating area. Owner Chris Martinson outside the Chelsea Alehouse location in the Clocktower development. The Chelsea Alehouse will also be downtown Chelsea’s only microbrewery, although the city was home to the state’s first microbrewery in 1982. Martinson, who lives in Grass Lake and works as an associate scientist at Cayman Chemical in Pittsfield Township, said he feels special ties to the city of Chelsea since his wife used to work as the executive director for the Chelsea Center for the Arts. “We are really immersed in the Chelsea community even though we don’t live here,” he said. Ann Arbor-based McKinley Inc. owns the Clocktower development, which includes five redeveloped buildings. Tom Gritter, vice president and managing director of commercial real estate for McKinley, called the Chelsea Alehouse a “perfect use” for the warehouse-type space. Martinson said he plans to hire four to eight full-time and several part-time employees and he will become the head brewer. Down the road, he hopes to start bottling or canning his Chelsea Alehouse products. He will also be launching a founding membership mug club within the next month, and the people who join will get their names written on the wall of the brewery. The mug club will offer discounts on both pints of beer and growlers. For additional Chelsea Alehouse updates, you can join the brewery's mailing list here. Fri, Mar 23, 2012 : 11:31 a.m. This is a great location. I love this part of Chelsea. I'm so glad they respected and save those buildings. The clock tower building is an architectural gem. Parking is a real plus. We will be sure to visit the new restaurant when it's open. We go to Las Fuentes now and enjoy the beautiful courtyard. Thu, Mar 22, 2012 : 7:59 p.m.
Fri, Mar 23, 2012 : 1:03 a.m.
Fri, Mar 23, 2012 : 1 a.m. There are no bears in Chelsea, you are confused. Thu, Mar 22, 2012 : 7:27 p.m. I am really excited about this. Chelsea NEEDS another restaurant &amp; bar. Seitz's is a sausage fest and Cleary's is ho-hum with a TGIChilibees atmosphere. I've been hoping for a micro brewery for years. I just hope their beer is better than the brews offered at Ann Arbor's micro breweries who seem to skimp on the ingredients of their beer. If it's anything as creative &amp; qualitative as Short's or Bell's beer, you're in business! So happy to see this happening in Chelsea. One of the best things about local breweries is the way they represent the local &quot;flavors.&quot; Whenever i go someplace new, I look for the different local brews available to see what that region has to offer. Thu, Mar 22, 2012 : 6:35 p.m. This is a great move. Not much in that area. He's also smart by offering food on-site. Thu, Mar 22, 2012 : 6:34 p.m.
&quot;The Chelsea Alehouse will also be downtown Chelsea's only microbrewery, although the city was home to the state's first microbrewery in 1982.&quot; I believe you're referring to Ted Badgerow and Real Ale. A man ahead of his time with what at the time was a ground-breaking product. I recall it being available at many of the local stores as well as upscale places like Escoffier on State Street. Fri, Mar 23, 2012 : 12:52 p.m. Yes, and not only was it the first micro in the state, it was one of only nine in the entire country, according to a July 25, 1983 Time Magazine article.